Update 2011 May 29 The sample code and library have been substantially upgraded. See my newer post for the details. Good progress last night and today. I get an interrupt for each received packet, working in both promiscuous mode and normal mode. Note to self: be careful to use mrf_read_long() when you want to use a long address, the address spaces overlap, so using mrf_read_short works, just doesn’t return anything useful. Ouch, this took a lot longer to get started than I thought. SPI is meant to be easy right? All my SPI reads from the MRF24J were returning 0xff. 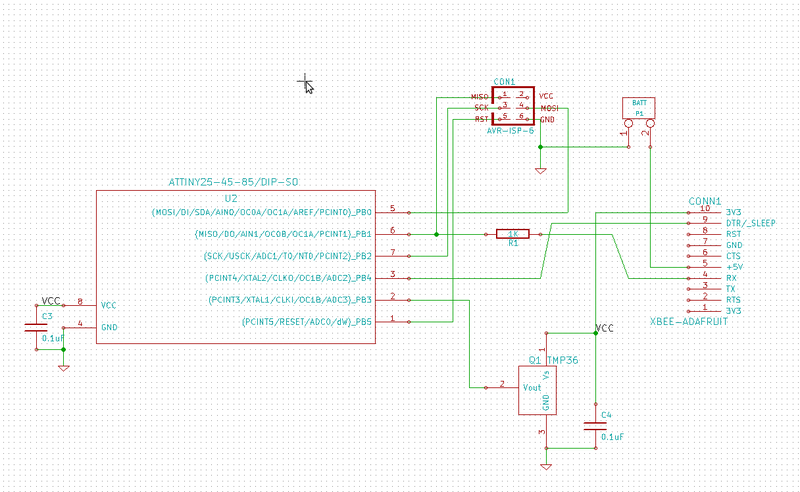 Turns out that, even with the /SS pin disconnected, if you don’t explicitly set it as an output pin in the DDR register, the AVR falls out of SPI mode if it ever goes low. So, even though the pin is not connected, (I’m using a general IO pin to do chip select on the radio module) nothing worked until I explicitly made it an output. And now, presto, I can read data from the MRF24J properly now! Now we can finally move on to the rest of this bring up. TinyTemp: karlnet sensor node 1. Also known as, massively overpowering a tiny system. With 2 xbees, and 2 xbee adapter boards from adafruit, making it easy to try things out on some breadboards, it was time to get to work. I had to get setup for embedded development again, and with orders from overseas taking a rather long time to get to Iceland, I made do with what I had on hand. ATTiny85’s are cool little chips. Not every day you get happy little 8 pin PDIP packages that can do so much. Not many pins mind you, but still, it’s so TINY! and it’s not even surface mount! So I got one of these set up on a board, after some basic blink testing, set about putting together “TinyTemp” probably the most outrageous wireless sensor mote ever made. I’m happier with some fairly ugly prototypes on breadboards, and then getting some boards made just for that node, and nothing more. I don’t need them to be physically expandable. If it’s just a tiny, compact node that does one thing well, it should just stay as one tiny compact that does one thing well. If you need more, you get a different node, or you put two nodes at the same location. But back to the board. I had a few goals that I wanted to explore with the board. With the radio turned on, and simply using busy waiting for the 5 second interval between sensor readings, and running on 5V, at the default 8MHz, the board was sucking down ~70mA. Wayyy to much to run on batteries! Enabling pin sleep on the xbee’s, and using up one of the valuable io pins on the tiny85 to switch the radio on and off for only long enough to send the data burst was a massive reduction. Straight down to about 20mA. Next was actually sleeping in the AVR, instead of busy waiting, which reduced it further, but not as far as I would have liked. Then, I cut the clock down as low as it would go, so that a single timer overflow would take the entire 5 seconds. That got me down to about 5mA, which, running at 5V with a venerable, but leaky 7805, was about as good as I could get. Now, with one real node alive and sending data, it was time to get onto some server software. There’s something very very screwy with the USB-serial connection on one of my computers. It doesn’t happen on any of the other ones, but one one, (unfortunately the one best suited to being the always on base station) The serial port seems lose a LOT of packets. This was exceptionally tedious, until I ended up with a LOT more error handling in the xbee-api mode python receiver. It will still drop packets, but now it reliably recovers within 3 packet times, before it could get some bad data and block almost forever. I’m not sure, but I feel it’s a kernel problem related to some changes in lirc usb polling rate. Kinda hard to prove though. Xbee’s actually have onboard ADCs, there’s no particular reason to put another micro on the board. Or is there? In this case, probably not, I could just use cyclic sleep with a nice long delay to get it to sample the thermometer. But, maybe not always. Cyclic sleep is still more power consumption than pin hibernate. And in a lot of cases, you might want to actually control something locally, and that’s not something you can easily do with sending pin change packets to a solitary xbee.